The Alf Thompson’s Barn Postman Pat Playset was first released by Character in January 2011. 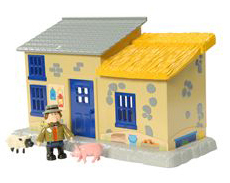 This playset features farmer Alf Thompson’s barn along with an articulated Alf Thompson figure, plus one toy sheep and one toy pig. Alf’s Barn is reversible and features an opening door. This set plays very well with the Alf Thompson’s Tractor release. The vehicles and figures are to scale and can be connected together with the road track which is sold separately.